Located near the intersection of E Main St and S Higley Rd, Extra Space Storage serves residents of Mesa. Locals will recognize our facility next to Desert Vista RV Resort near Westernaire, Colonade, and Days Inn Mesa East. We're also accessible for residents of nearby apartments, such as Mesa Villa Apartments, Island Palms Apartment Homes, Calusa Trace Apartments, and more! Extra Space Storage on E Main St offers a large selection of storage units, climate-controlled storage, vehicle storage, and exceptional security. We're the solution for you in Mesa! 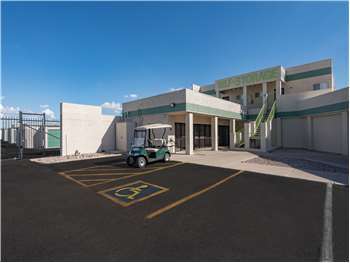 Our Mesa storage facility has unit sizes from 5x5 to 20x40 with convenient features like first-floor access, drive-up access, and more. We have the space to handle both residential or commercial needs! At Extra Space Storage, we're committed to keeping our customers and their belongings safe. That's why our E Main St storage facility utilizes advanced security measures like security access to your floor only, electronic gate access, 24-hour video surveillance, and an on-site resident manager. Worried about sensitive items? Keep them safe year-round in climate-controlled storage! Climate control keeps your unit between 55 and 80°, protecting belongings from Mesa's extreme heat. Climate-controlled units are available in sizes 5x5 to 10x13. Need to store a vehicle in Mesa? Extra Space Storage offers 10x20 to 10x55 outdoor parking spaces and 10x10 to 20x40 enclosed drive-up units that can handle cars, motorcycles, boats, and RVs. At Extra Space Storage, we pride ourselves on being the storage partner customers can trust! Our facility is always clean, secure, and well-maintained, and our friendly, professional staff strives to make your experience an excellent one. Contact us today to reserve a storage unit in Mesa! I was very pleased with the quality of customer service and knowledge that I received at the mesa Location. I would absolutely recommend this company to friends and family. I was able to find a good price an Great Customer service. Extra Space Storage is Great place peronal stuff in a place you can trust and be safe. friendly people clean and the prices was right. and go location. We had looked at just about every Storage/rental space in Mesa Arizona area but everyone wanted me to come in and sign the paperwork but ESS found a place close to me in Minnesota. Facility is nice, clean and in a convenient location. Associates will assist you in any way possible by providing recommendations of storage space as well as working with the monthly cost for the unit itself. The Rental office staff made the experience very easy. They were helpful in deciding what type of unit would be sufficient for my needs. They were courteous, helpful and very professional. The prices for the units are very competitive with others I researched. The facility is well maintained (very clean). I have used storage units in my past. Extra Space Storage is the cleanest I've seen and staff were extremely helpful. Referred me to other storage because they didn't have one of ailable in the size I needed. Great customer service. Neat and clean. Appears well cared for. Clean Secure Space! !Good place at a good price. We had great, friendly, knowledgeable service from David. The area was clean, well lit and very secure. We will highly recommend this site. Top of the line STORAGE company, The person went above and beyond his job! Thank you !!!!! Great price! David was quick and efficient, but also took the time to answer all of our questions. He also explained payment options that may be beneficial to us. We like that he lives on-site as well. Great location, easy access, professional staff. After looking into several storage areas, Extra Space was easier to monuvere when parking my trailers. David was very helpful!!! Excellent Management, Facilities and ease of use. Had problems entering my storage area one day and after a quick phone call they fixed the gate problem pronto! Keep up the great work guys!!! This facility has a great layout and secure but trouble free access. The staff is very helpful, and acquiring a unit was an easy process. I would recommend this facility to my friends and family. I have had no problems with this facility. Payments online is a little long from the site but good as a whole. This was a good, reasonable priced storage close to my Brother so he can come and go until 10pm and sort through things in prep to moving out of state. Coming in with a UHaul truckload from out of town, the staff was very helpful in helping us select units to meet our needs. Arranged via a phone call in advance of arrival, they had everything ready for us. Staff is super friendly and accommodating. Rental rates were the lowest in town. I was moving back to AZ from another state and they helped me secure a storage unit over the phone with the help of my parents too. I've used this facility to store my RV for the past 6 years. Usually store it for 6 months at a time. The facility is clean & with onsite residence you get an added feeling of security. This facility is easy to get to. I'm always able to get right in and out. And the hours are great . The staff are always friendly as well. We needed a space to store our car and travel trailer and it worked out great for us. We rented a small unit in the spring to store items from a shed we had on our RV lot because we sold the lot. This fall when we returned in September we had moved into a park model trailer with an AZ room that was totally furnished. When we moved from our RV to the trailer we had a lot of duplication and needed more storage space. We rented a larger storage unit and your employees were very considerate in coordinating our move from the smaller unit to the larger one. Plus we shipped items from WA to AZ so it was good that we have a larger storage unit. Anthony was very helpful and knowledge made me feel at ease. I felt I was in safe place and I needed that at that particular moment. Staff was extremey helpful in answering questions. The location is very convenient and easy to access. The price is definately unbeatable! My experience with this facility was great. The staff was accommodating and friendly. I had reserved the wrong size storage and they worked with me to give me what I needed at little change in cost. Every day that I came during the move I would see a staff member outside and they would wave with a big old smile on their face. Easy access storage. I would recommend anyone to use this facility. The facility is fresh-looking and clean. Driving/parking aisles are nice and wide. There is a resident manager's apartment on the second floor above part of the facility so security seems very good. Really conveniently located and easy to access, have not had to utilize staff guidance much but, have been pleasant when needed. A friend picked the location for us but so far we are very happy with the service, location and ease of making our payments on their easy-to-use website. the facility is clean easy to get around and safe. The staff is helpful and friendly. I've never rented storage place like this. Their great!! The facility staff is excellent and always ready to answer questions or help you out. They always greet you with a smile and a hello . You can tell this facility is well kept. I really like everything about this facility....the staff, the convenience, the billing on line and the cleanliness of the grounds. Keep up the good work. SO easy to work with. Needed a few extra days in my unit, and the prorated the days instead of charging another whole month. Would use again! Drive south on N Higley Rd. Turn left onto E Main St. Our facility will be on your right after U-Stop Convenience Store. Drive north on N Higley Rd. Turn right onto E Main St. Our facility will be on your right after U-Stop Convenience Store. Drive west on E Main St. Make a U-turn at the Higley Rd intersection and continue east on E Main St. Our facility will be on your right after U-Stop Convenience Store. Drive east on E Main St. Our facility will be on your right after U-Stop Convenience Store.